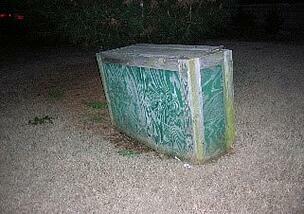 What Made Fiberglass Backflow Enclosures So Popular? As you know, protective enclosures for backflow preventers and other waterworks equipment come in many shapes and sizes. These days, we typically only see aluminum, fiberglass enclosures, backflow cages, and sometimes brick and block. However, this wasn't always the case. Back when Hot Box began manufacturing enclosures in the 80’s and the market began to grow, “enclosure” was a loose classification at best. The images below are case in point. Besides the lack of aesthetics of these covers, there were other problems. Some enclosures may have had either too much or too little insulation. They may have also used heaters that are unsafe. In response to wide variations in enclosure quality, the enclosure manufacturers got together with ASSE and came up with the ASSE 1060 Standard to give structure to the enclosure market as a whole. With guidelines and regulations to follow, the enclosure manufacturers then began to create brand recognition, preferences in style and function, and buying habits within the industry. Enclosure manufacturers following ASSE 1060 regulations emerged across the country and naturally, the material used by the region's manufacturer became the preferred norm. The water authorities in North Carolina were early pioneers in the above-ground application of RPZ backflow preventers. Not only were they some of the first jurisdictions to recognize the dangers of confined space vaults, but they've also required the extra protection of RPZs on their domestic water services for a long time. 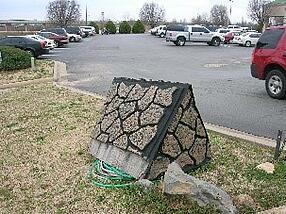 As a result, North Carolina became the first large market for backflow enclosures. Since Hot Box was manufacturing most of the enclosures at the time, and they were manufacturing fiberglass in Jacksonville, FL, a lot of the early specifications were written around fiberglass enclosures. As the market grew and above ground RPZ installation within an enclosure became the standard in North Carolina, other manufacturers followed the trend in fiberglass. BF Products, based in the Carolinas, successfully packaged their fiberglass enclosures with a backflow preventer and have grown market share and buying habits for many years. 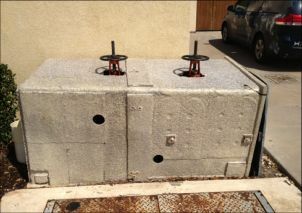 Since fiberglass backflow enclosures were the only option in the early years, they became the habit in purchasing and preference. As the RPZ trend spread up the east coast, it also spawned followings westward through West Virginia, Ohio, Kentucky and all the way though Reno, NV and the Pacific Northwest. 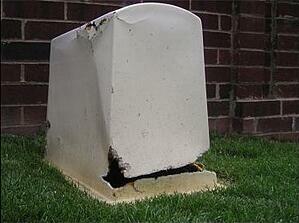 Specifications for fiberglass enclosures were prominent and buying trends naturally followed. Even though there are now more ASSE 1060 certified enclosure options, fiberglass remains king in certain areas. Of course in regions where aluminum was the norm for decades, such as Tennessee, aluminum is the enclosure material of choice. Habit has designated preference, and both are hard to change even if to change would mean better protection and a better product. As time has passed, the cons of fiberglass enclosures have come to light. Fiberglass is relatively inexpensive to make and withstands caustic environments well. It is, for the most part, flexible in sizing and options. However, it has issues with durability, from UV exposure and tools as you can see from the image of a weed-whacked enclosure to the right. Shipping can be difficult because it can't be shipped flat like aluminum, and sometimes the fiberglass cracks or the insulation separates during shipping. It's also more difficult to repair, requiring specific weather conditions, acetone, a patch, a dremel, resin, sandpaper, and hardener. Aluminum enclosures have proven to be the best overall value for enclosure installation. The superior construction, lasting durability and ease of shipping have changed a lot of the habits of purchasing fiberglass. Although specifications and habits still remain from the early days of the enclosure industry, most have come to realize that aluminum enclosures are the best practice and offer the most value for all enclosure applications.